As the title implies, this is an interactive storybook for children. Reuben is excited and proud because this is the first day he is being permitted to walk to school on his own. He hurriedly makes his way past the scary alley along the way and is nearly at school when he hears a howling distress sound from a ditch near the road. 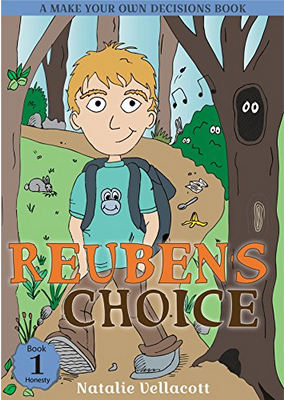 Reuben faces his first decision. Should he stop, disobey his mother’s instructions, be late for school, ignore a plea for help? Readers are given four choices. When they make their choice, they are directed to a page which gives them additional questions and outcomes because of their choices. Eventually, readers will reach the last choice and be directed back to the beginning of the book until they reach the end of the story. Children will learn that honesty is the best policy and that all our actions have unforeseen consequences. The book provides lots of important discussion topics for parents and teachers. Interactive reading encourages children to keep reading and gives them the power to control the story outcome. Recommended especially for children in the eight to twelve age range. If you enjoyed reading this post, please subscribe by clicking on the word Follow or by hitting the orange RSS FEED in the upper right-hand corner of this page. 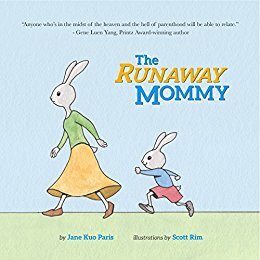 This book contains a similar story to The Runaway Bunny except that in this edition the parent is running away from the child. The text layout and illustrations are simple, suggesting that the book is appropriate for younger children. On the other hand, the vocabulary which includes things like a tech startup, trauma surgeon, and flamenco dancer, probably won’t resonate with a younger child. The plot revolves around a mother bunny who threatens to run away and pursue new careers around the globe. Her young child is willing to accompany her no matter what role mom decides to pursue. This short book could be an amusing bedtime story if the parent is careful to explain he or she does not intend to run away. The humor will be appreciated more by adults than children. AJ is the middle child. He has an older sister, Jane, who is learning to drive and a younger brother, Taj, who has the gross habit of picking his nose. AJ’s mom is a neatness and control freak, while his dad is laid back. 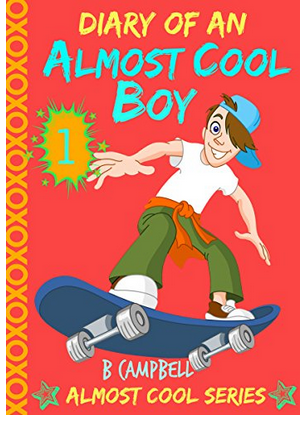 Middle school readers will love the humorous situations in which AJ constantly finds himself. Cedric is the classroom bully, and the new boy, Hawk reveals a secret to AJ that will eventually enhance AJ’s reputation. Readers will enjoy reading about the family foibles and mishaps, as well as the sixth-grade classroom escapades. There are a few valuable life lessons to be learned, but the plot is fairly predictable with few twists and turns. This year I had the honor of participating on a panel of judges to determine the winners in the Easy Reader and Early Chapter Book categories of the 2017 Cybils Blogging Awards for Children’s Literature. Today I would like to share my reviews of the winning books in the Easy Reader and Early Chapter Books. I will share reviews of the finalists in each category in the next few weeks. This is the first book in the mystery series featuring Kayla and her golden retriever, King. I enjoyed the author’s approach of first introducing the dog and later his human, Kayla. King is frustrated that he cannot communicate to his owner in words, so he uses actions to express himself. By the end of the tale, readers learn more about King’s intelligence. Kayla and King answer the doorbell. No one is there but a letter has been left on the doorstep. When Kayla’s friend Mason comes to visit, he reveals that he has received a letter as well. Neither of the friends can read the letter because it is written in secret code. Kayla and Nathan set out to decode the letters. They find that only the second word is different. King is sure he knows the author, but the humans don’t understand what he is saying. A chance meeting with Jillian, who lives a few houses away may hold the key to the mystery. I would consider this book more of a chapter book than an easy reader. Children in second and third grade will better understand the nuances and messages of the plot. This book presents multicultural characters and interactive learning opportunities. Recommended for boys and girls in the seven to nine age range. Book 1 of a new series featuring a cavy named Gizmo and a corgi named Wedgie. Gizmo introduces himself as a Genius with an Evil Plan. Gizmo has recently been uprooted once again. He began his life in a pet store where a parrot taught him to read. His human, Elliot, chose him and brought him home. But Elliot’s dad has remarried and now Gizmo must learn to live in a new human house. Elliot now has a stepsister named Jasmine and a stepbrother named Jackson. Worst of all, Wedgie, their corgi pet, wears a cap and thinks he is the protector of the family. 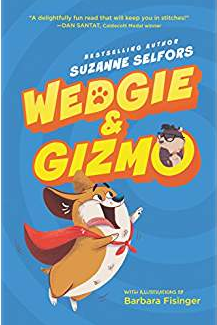 The book hilariously describes how Gizmo and Wedgie compete for control and human attention. Gizmo gets seriously ill when he attacks a cereal box in the pantry, and Gizmo hatches a scheme to get Wedgie in trouble with Jasmine. Selfors artfully weaves the animal conversations into the story. Children who feel displaced by moving or becoming a part of a blended family will empathize with their situation. Gizmo undergoes serious trauma when he learns the grandmother comes from Peru where caves are eaten. There are a lot of twists and turns, laughter, and tears, as the new family learns to live and love each other. The illustrations are fun and humorous. My favorite illustration depicts grandmother (abuela) sleeping in bed with curlers in her hair while Gizmo places a delivery label addressed to Peru on her head. The story is almost two hundred pages and that might be a challenge for beginning readers. While the plot moves along quickly and is really entertaining, I believe it better suited to a third to a fifth-grade audience. Can’t wait to see what happens in the next book. If you enjoyed reading this post, please subscribe to my blog by clicking on the word Follow or by hitting the orange RSS FEED button in the upper right-hand corner of this page. Happy Valentine’s Day – give the gift of reading to someone you know or love! This is a delightful tale about a little boy called Little Sleepy because he had difficulty waking up each day. Little Sleepy enjoyed his dreams so much that he often slept through most of his daily routines. One night the boy slid down a rainbow right into his dream. 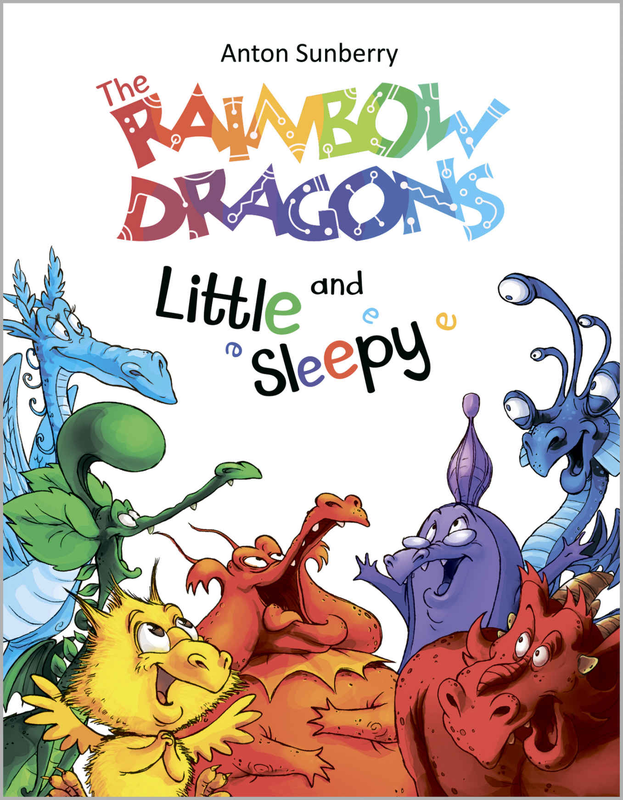 There he met several dragons who were different colors of the rainbow. Each of the dragons thought himself to be the best because each possessed a unique talent. These talents included things like being strongest, funniest, most observant, best cook, best musician, and most creative. Sleepy cannot decide who is the best and suggests that the dragons will be better served by combining their talents. Only then will the dragons be able to create the rainbow bridge. If they agree to work together, Sleepy will succeed in returning home to his parents with a valuable lesson. Illustrations are done with heart and in brilliant colors. 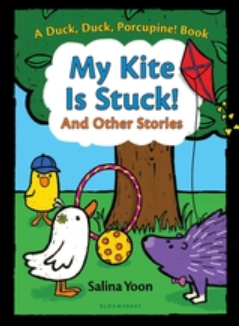 Preschoolers and primary grade children will enjoy this tale. Sleepy-heads might even be encouraged to wake up and see their world. This is a charming, hands-on book for curious, young scientists. Daniel and Allison are twins who are listening to their Aunt Melissa, who has just returned from a trip to South America. She is showing them pictures of her climb to the top of a volcano. Their interest immediately peeks when their parents ask if they would like to create a volcano of their own in the backyard. The twins eagerly jump at the opportunity. 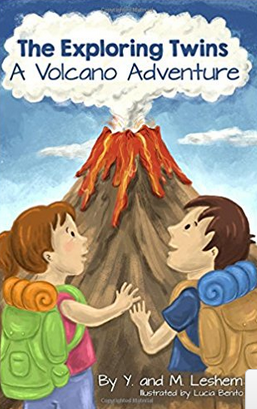 The second part of the book explains in easy to understand text and vivid illustrations how a volcano looks and what happens when it explodes. Then the authors present the materials necessary to create an exploding volcano from ordinary household materials. Each step leads to the climax of the explosion. 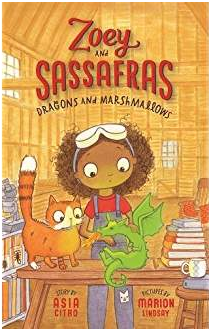 This book is an effective combination of endearing characters and a recipe for a science experiment that any family can share together. I have seen this experiment done in the classroom many times and it never fails to amaze budding, young scientists. Highly recommended for elementary and middle-grade students as a good choice in the STEM category to encourage a greater awareness of science all around us for both girls and boys.